Hi, wenn ich in der DC8 mittels button A die Sichten wechsle, kommt der allseits beliebte Hung Fehler, siehe Bild. Passiert nur bei der DC 8. Neueste Nvidia Treiber sind installiert. Karte ist die 970-er. My apologies for answering in English -- I can't write or speak German. I have the same graphics card and have never seen this problem. I never update my drivers although I think Windows may do it from time to time. Presently I have Geforce 388.13 WHQL installed. No one else has reported a similar problem, so I think it must be something unique to your system. So, I have to explore what this is with the crash of P3D. Last time, 20 minutes ago, it crashed the hole computer. Double check the power connections on your gfx card. Monitor your temperature of your card (using a program like GPU-Z, or nvidia's monitoring) while running P3D. I would do that, and also update to the latest driver. Are you seeing this many times? Or just this one time? thx for jumping in here. Yes I have it always when I am using the DC8. Curious. No other a/c has this problem.. Using NvidiaInspector for driving the Fan of my GPU. Latest driver for Nvidia is installed.. So. I have no idea..
Do you have any other aircraft with TrueGlass? as far as I know: No, just the DC8.. Do you think that can be the reason ? I doubt that as there are tens of thousands of people who are using that now. Is this a 'reliable' error, meaning you can replicate it? I also had this error, but only once. It happened while testing our Airbus, but it is simply not recreatable. After experiencing this error, I spent over 2 hrs of permanently starting and closing P3D with the Airbus without getting back this error. 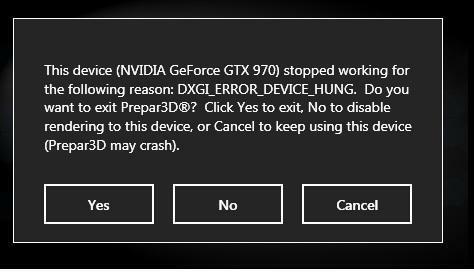 As this error appears very frequently with other PC games on the market (outside flightsim) it is hard to tell what the root cause might be, maybe a combination of certain variables like DirectX calls, certain graphicard drivers etc. But for the moment impossible to track down. Thank you all for your really kind help so far! Steffen -- my original suggestion on June 12 is above. You could be having hardware failure or insufficient power. Yes dear Mace, I remembered your advice and tested it. So I have to check what hardware reason it can be.